In early 2019, Portland Bolt was called on to supply stainless steel bolts for the hand railing on the Bonner Bridge Replacement project in North Carolina. The original seeds of the project began in 1989, but ground was broken on construction in March of 2016. 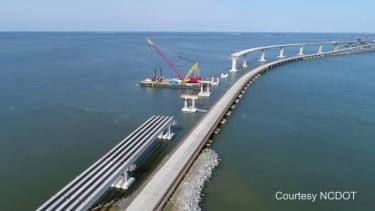 The replacement bridge is being built parallel to the existing bridge and carries N.C. 12 over Oregon Inlet in Dare County. The new bridge is 2.8 miles long and is designed with a life span of over 100 years. Portland Bolt manufactured over 1,000 lbs. of domestic stainless steel hex bolts. With a required non-standard thread length, Portland Bolt was able to manufacture these parts using our Waterbury Farrel flat die roll threader, which is faster and more efficient than our Landis cut threaders (Rolled vs Cut Thread Bolts). If you are working on a bridge, Department of Transportation job, or any other project that requires domestic parts, give one of our friendly sales people a call and we will be happy to help.